20 year old Ayat al-Ghermezi has been reportedly tortured and sentenced to one year imprisonment for reading a poem in public that criticized the Bahrain sheikhdom. Press TV talks with Rodney Shakespeare, Chairman of the Committee against torture in Bahrain from London about his reaction to this latest of many illegal judicial proceedings in Bahrain. Thirty-three people have faced military court hearings in Bahrain despite the lifting of the martial law by the Al Khalifa regime earlier this year. 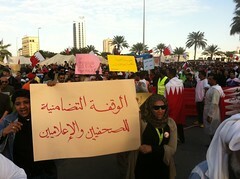 The defendants are facing charges including trying to topple the Bahraini government. Those facing charges are two former lawmakers, Jawad Firouz and Matar Matar, along with a female poet. Press TV interviews Saeed al-Shahabi, a Bahraini opposition leader in London, as he shares his views on the Bahraini Prime Minister’s trip to the United States, and the current situation taking place in the Middle Eastern country. This entry was posted in All Posts News Politics and-or Videos, Dandelion Salad Videos, Death-destruction, Human Rights, Justice or Injustice, Police State, Politics, Prisons, Torture, Torture on Dandelion Salad and tagged Ayat al-Ghermezi, Bahrain, Bahrain Protests Revolution 2011, Human Rights on Dandelion Salad, Police State on Dandelion Salad, Rodney Shakespeare, Saeed al-Shahabi. Bookmark the permalink. ← Take Action: Rescind Obama’s “Transparency Award” Now!